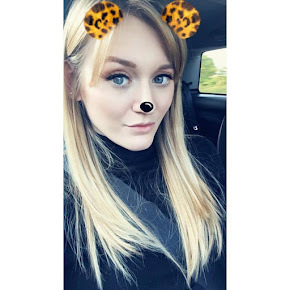 So tonight our local shopping centre in Leamington Spa hosted a Student Takeover event, where basically from 6-9 there were huge discounts in all of the stores, including Gap, Superdry, Topshop and New Look, and also lots of prize competitions and freebies. Me and my flat mate decided to venture down for some retail therapy after what has been an extremely busy start to term. I only ended up buying a jumper from Topshop, but I am SO pleased with my purchase. I've had my eye on it for a while now, and with 20% off and a £10 gift card from my birthday, it only came to £26 which I thought was a real bargain! I also picked up some free food they were giving away, so a shot of an Oreo milkshake, and some samples of starters from Pierres restaurant. 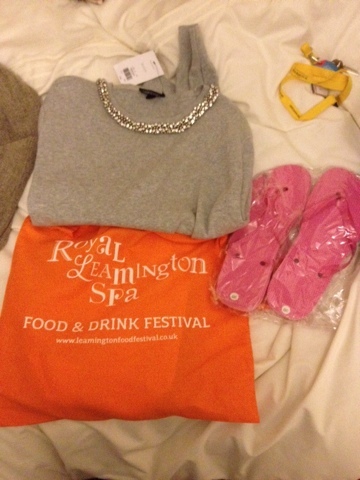 We also received a free "Leamington Spa" goody bag, and went to chat to the PCSOs for a bit who gave me the flip flops pictured! I also won a travel card holder in Cath Kidston, which retails at £14 so I'm quite impressed! I'm not keen on the pattern myself, which is unlike me as I love Cath Kidston, so I'm deciding who to give it to as a present when I go home this weekend! After an hour or so of shopping, the hunger pains kicked in and we headed over to Prezzos. It's one of our favourite places to eat and I definitely recommend looking online and signing up to receive their offers. You can really save money on your final bill! 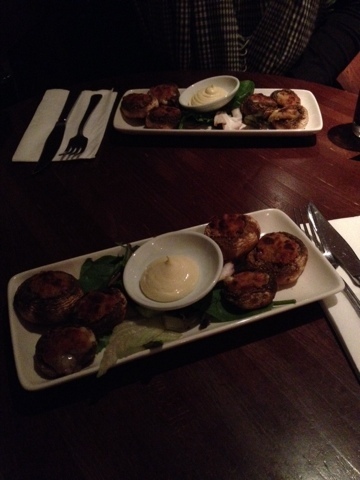 I had baked mushrooms to start which were filled with Mozzarella and Gran Padano cheese, and breadcrumbs with a garlic mayonnaise dip. 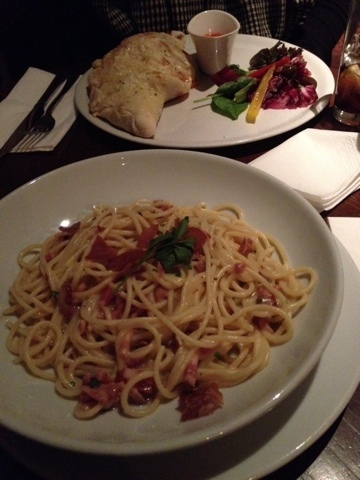 For main, I had Spaghetti Carbonara which is AMAZING at Prezzo. It was really nice relaxing for the evening after what has been a hectic week. I'm going home tomorrow for the weekend as well which I will almost definitely be blogging about! I definitely recommend heading to any student nights your local shopping centres and towns hold. We saved so much money and received vouchers off for future orders :) and let's face it, us students love our freebies and bargains!